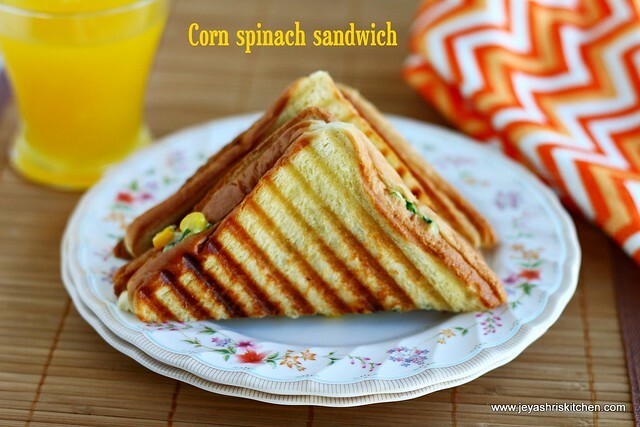 Few days back while casually talking with a friend she was telling that she made corn spinach sandwich for breakfast. 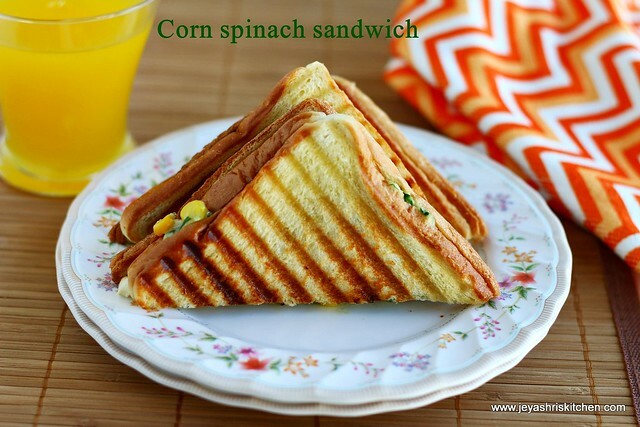 I have heard about this winning combo of cor, spinach and cheese in sandwich but never tried. 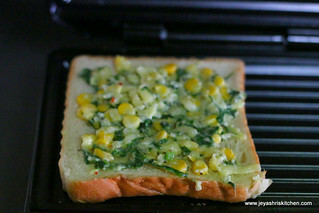 So wanted to try out this cheesy corn and spinach sandwich as i had all the ingredients at home. 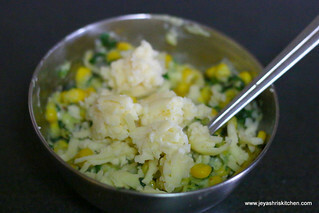 It turned out very well, clicks were not upto the level i expected but i don't want to miss posting this recipe. 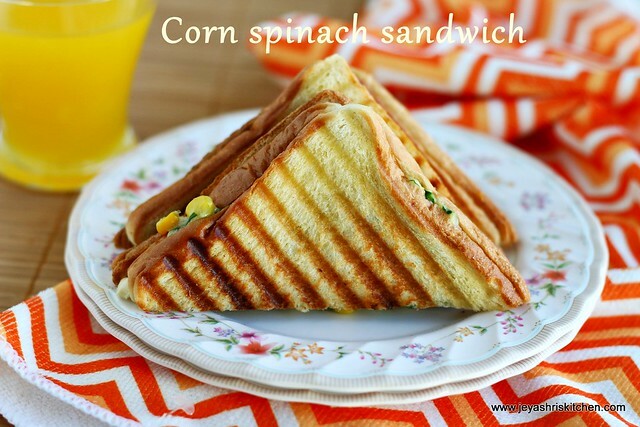 You can try this sandwich on weekend for breakfast or for evening snack too. Perfect snack for kids when they come back from school. 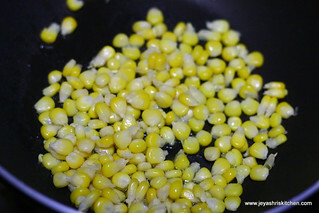 * I cooked the corn in pressure cooker and took the kernels out. If you are using frozen corn, just thaw it for 10 minutes and use. 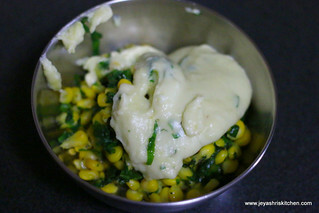 In a pan add oil and add the corn kernels and saute for a minute, add the spinach to this and cook for a minute. Add salt, red chili flakes , oregano or pepper powder to taste. Cook for a minute and put off the flame. 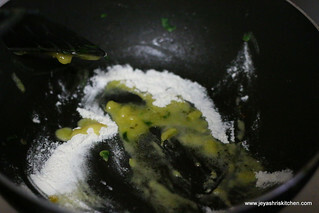 In the same pan, add butter and add int the maida flour also. Saute in a low flame till the butter and the flour gets nicely incorporated. 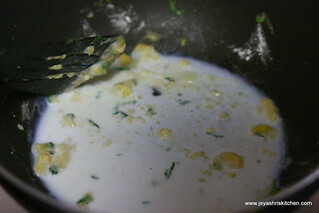 Add the milk and cook it in a low flame without getting any lumps. It will take 2 minutes for you to get a nice paste. 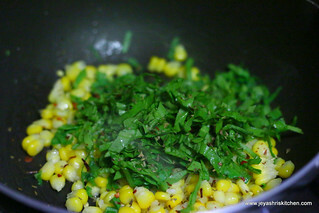 Put off the flame and add it to the cooked corn and spinach mixture. Add the cheese to this and mix well. 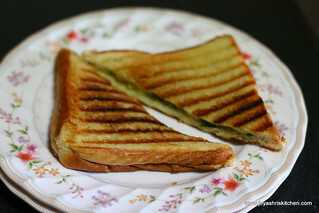 You can either do in the tawa or in the sandwich grill too. Spread butter on the bread and spread the filling in one side of the bread. 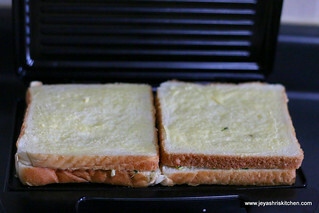 Top it with another bread and cook in a sandwich maker or tawa till the top portions become nice golden brown. If you want you can serve them by cutting this into triangles. Instead of oregano and red chili flakes you can add finely chopped green chili and chaat masala too. You can skip the step of adding the maida white sauce too. 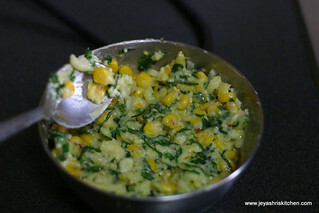 Just cook the corn and spinach and add the grated cheese and go ahead. 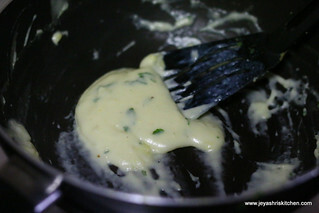 If the top portions need to browned nicely add butter nicely. Spinach is a type of greens right? If I dont get it wat type of green can I add? yummy recipe.. Can we try this with brown bread too? Hi. What does all purpose flour means? It's plain flour or maida.